Despite my beliefs that I will stay in one spot for longer than a week it proved once again that planning is just very unrealistic thing to do when you are a blogger or just someone who embraces travelling. I am leaving again today, which means that there is a lot of packing and crazy running around happening in my house while you are reading this. It was totally unexpected so I am not quite prepared…at all. This is the last outfit post I have for you from Paris, white culottes, floral jumper and a denim shirt, layered in a little transitional outfit. I feel like us bloggers see some trends before they become huge, so we are over them sooner, which I feel is the case with culottes. I wore them first time sometimes in January and I felt like that was their peak, even though they are booming more and more. I love how comfortable they are and the tailoring is not compromised at the same time. Win-win. This Artelier.mx bracelet with the world map quickly became one of the favourite things I actually own. Besides the fact that travelling is a huge part of my lifestyle, I love looking at it, and it inspires me to pursue my dreams and to seize every chance, as nothing is too big or small. I have worn it quite a lot recently, and really love how happy it makes me every time I look at it. Off to pack now, I want tell you the destination, but its longer flight than usually…I will post some hints on instagram, so make sure to follow me @theglamandglitter. Uprkos mom verovanju da cu kod kuce ostati bar malo duze od nedelju dana, jos jednom je dokazano da planovene treba praviti. Danas opet putujem, sto znaci da dok vi ovo citate, ja trcim po kuci, gore dole, pokusavajuci da spakujem sve neophodno i da se pripremim za put. Sve je ispalo totalno neplanirano tako da nisam ni blizu spremna. Ovo je poslednja kombinacija iz Pariza, bele kapri siroke pantalone, koje se na Engleskom zovu culottes (da li ima naziv i na srpskom? ), duks sa printom i teksas kosulja. Osecam se kao da mi blogeri imamo pristup nekim trendovima malo ranije, pa nas smore i pre nego sto se pojave na trzistu. To je generalno cinjenica kod pantalona ovog kroja, vidim da su svugde prisutne sada, ali se secam da sam ih nosila jos u januaru. Ono sto mi se dopada jeste sto nema kompromisa izmedju udobnosti i kroja, vec su i jedno i drugo prisutni. Kako god okrenete vi ste na dobitku! Artelier.mx narukvica koju mozete videiti vec u nekoliko postova je postala jedna od mojih najvecih favorita.Osim sto je putovanje veliki deo mog zivotnog stila, te me ova mapa uvek na to podseca, takodje obozavam da gledam u nju kad god stignem. Inspirise me da ugrabim svaku mogucu priliku, jer nista nije premaleno a ni preveliko, bas kao ni svet na mom zglobu. Sada idem da se pakujem, ali necu vam otkriti destinaciju. Malo tragove cu ostaviti na instagramu pa me pratite tamo @theglamandglitter. Love this bag and shoes! Great bag! I love the pop of red! Apsolutno si savrsena u ovom outfitu! Hlace i torba su top-top!! I love the flashes of red in this outfit Tamara. Also, I just got the same Celine sunglasses after seeing them on you (hope you don’t mind!). I noticed your cuff in previous posts & love it, it’s very apt for all your travels right now. Can’t wait to see where you’re going next. Bon voyage Sweetie! What a beautiful look! Love the way you styled the culottes! I love the sweater, the floral print is so pretty! 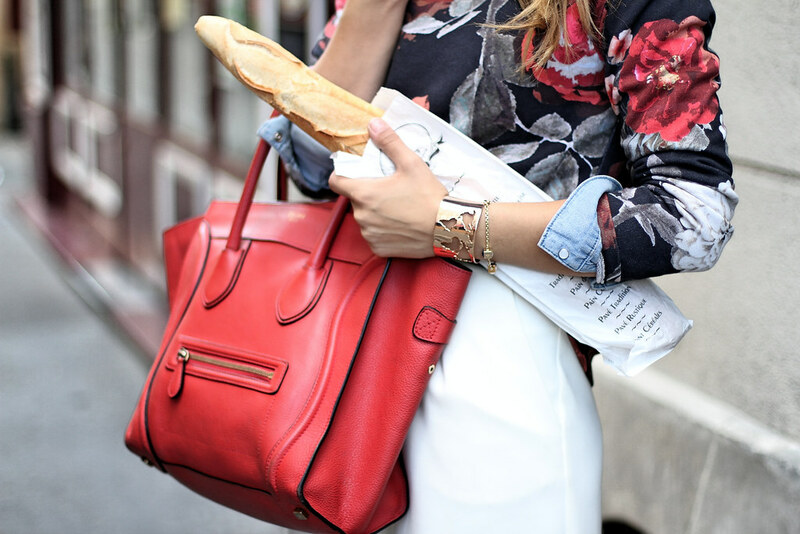 The baguette looks delicious, and I would do anything to be in France. I love your bag and shoes. It’s great with baguette too! 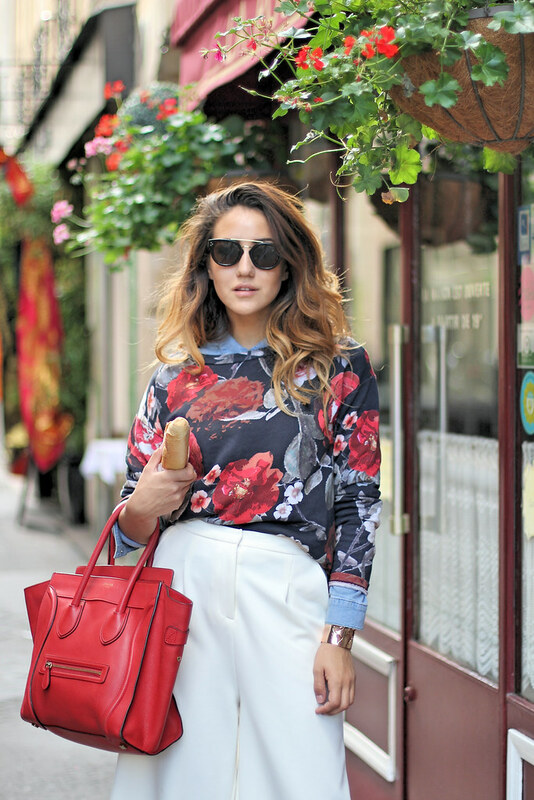 Such a parisian look! It’s gorgeous! 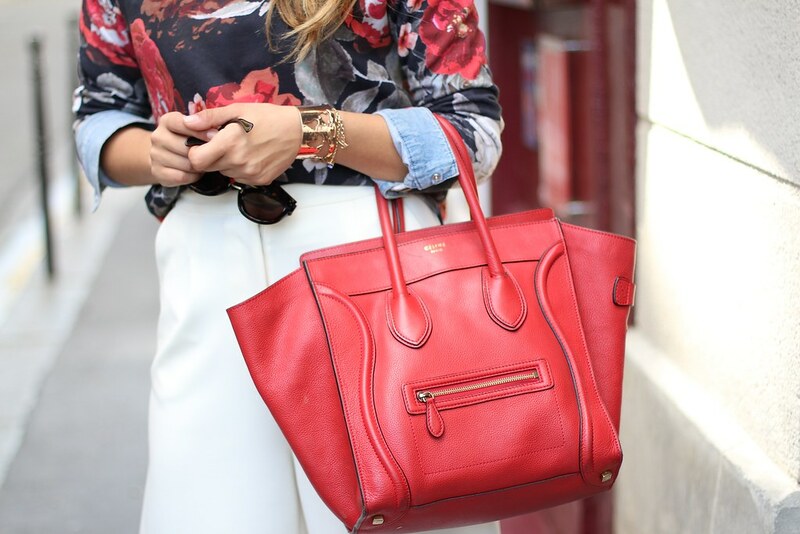 Perfect, beautiful bag and gorgeous shoes lovely. There are moments when look like Monica Belluccis daughter. Just gorgeous! Very chic, love your gorgeous shoes. One day i want also own a pair.